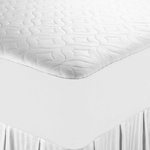 The Pillow Topper Mattress Pad will give new life to your mattress and will immediately provide your bedding package with a premium upgrade. 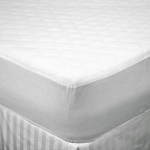 This is a true luxury pillow top mattress pad that will give your regular mattress the feel of a pillow top bed because of an impressive 24 ounces of EcoSmart Fiber (recycled bonded polyester fiber) fill per square yard. The Wholesale Pillow Topper Quilted Mattress Pads will fit up to a 16 inch mattress and are machine washable and dryable. 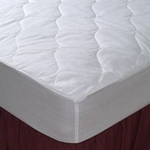 These Topper Pads have a T-200, 55% Cotton/45% Polyester Fabric with stretch-to-fit side walls to provide long-lasting durability. This pad is manufactured with an Expand-A-Grip elastic skirt to keep it in place and make it easy to install.